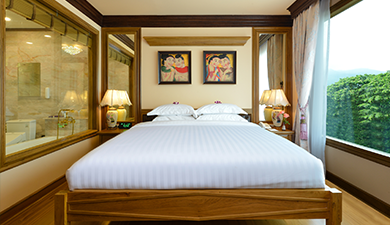 Opening in 2017, Peak Nimman Prestige Hotel is situated in the central part of Nimmanhaemin road, one of the most popular areas in Chiang Mai. The luxurious hotel is furnished with Lanna-contemporary style blended with modern equipments. All structures are made from teakwood featured with wood-carving furnishings. Our hotel’s landmark feature is ‘the golden roof’ as a tourist attraction. At 12 am and 6 pm everyday, our guests will hear Lanna-style gong as a traditional Northern way of time-telling. 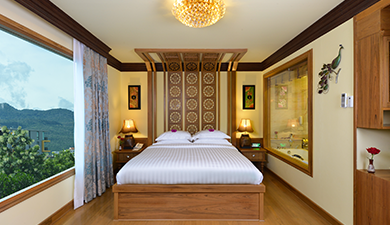 Each of the 21 rooms on the 4-story hotel is unique, designed specifically to show different parts of Lanna culture. Our privileged guests can conveniently go immerse themselves in Northern Thai lifestyle e.g. street foods, restaurants, nightlife, or Maya shopping center. At the center of the city, the transportation is easily available for nearby tourist attractions; for example, temples, zoos, mountains, etc. 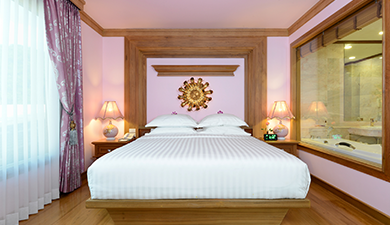 No matter what your goal at Chiang Mai is, this hotel is the heart of your stay in Chiang Mai. Internal Area : 36 sqm. Internal Area : 24 sqm. offers 21 elegantly designed suites.